The WarmlyYours floor heating kit with cable is designed for applications until tile, stone and nailed hardwood floors. This free-form cable provides the ultimate in flexibility, making it easy to customize installation for rooms of any size and shape. While ideally suited to provide complete floor heating coverage of rooms with unusual dimensions, the cable can be used in any room and installed at 3 or 4 intervals to meet the needs of any installation. Along with comes the programmable nSpire Touch which features a 3.5 full colour touchscreen and a modern design. The Touch allows you maximum control over the floor temperature with 4 programmable events for each day of the week, which is great for Goldilocks households where there will be frequent adjustments to the temperature or thermostat's schedule until it's just right. This thermostat puts the control where it belongs, at your fingertips. Includes floor sensor. The WarmlyYours floor heating kit with TempZone Easy Mat is designed for applications until tile, stone and nailed hardwood floors. It allows for radiant heating of smaller, simpler areas at an affordable cost. These under floor mats are perfect for providing radiant spot heating for moderately sized bathroom and kitchen floors or just the high traffic cooking areas of larger kitchens, in front of a vanity or in a powder room. Along with comes the programmable nSpire Touch which features a 3.5 full colour touchscreen. With an integrated Install Wizard, it's never been easier to set up a radiant heating system per your preferences and schedule. It allows you maximum control over the floor temperature with 4 programmable events for each day of the week, which is great for Goldilocks households where there will be frequent adjustments to the temperature or thermostat's schedule until it's just right. Includes floor sensor. 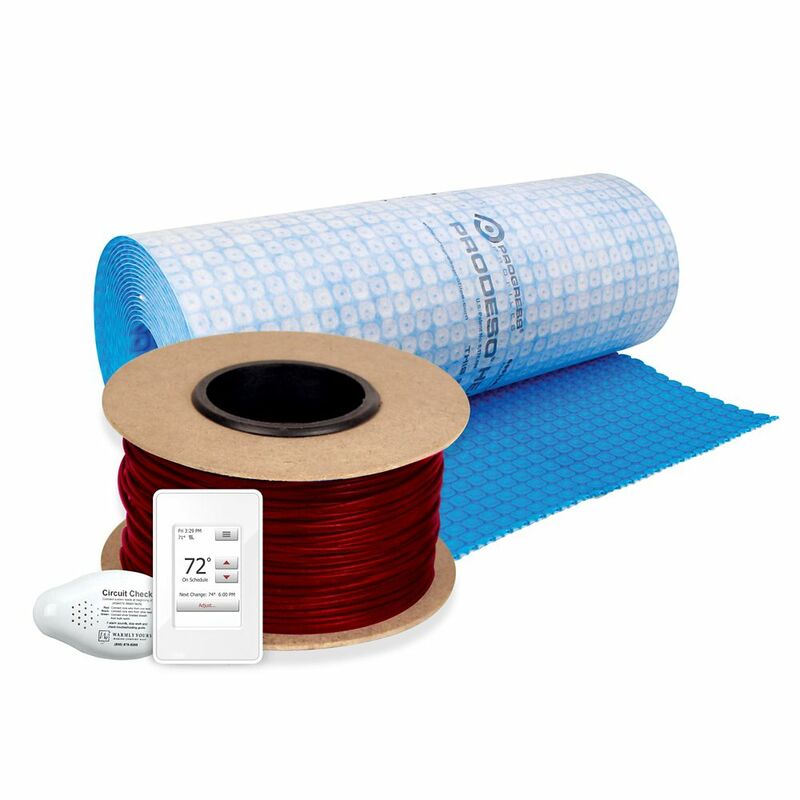 Floor Heating Kit 120V-Tempzone Cable System 180 Feet + Heat Membrane & Thermostat The kit with cable is designed for applications under tile, stone and nailed hardwood floors.This free-form cable provides flexibility to customize installation for rooms of any size and shape. It features a twin conductor with a 15 cold lead and it can be installed at 3 spacing on the floor. Comes with the programmable nSpire Touch which features a 3.5 full colour touchscreen and a modern design that instantly augments any rooms style. The nSpire Touch allows you maximum control over the floor temperature with 4 programmable events for each day of the week. This dual voltage 120V/240V thermostat includes floor sensor. The Prodeso Membrane minimizes efforts while fitting a heating cable for electric floor heating. This heat membrane allows quick installation of tile and floor heating over a variety of different substrates, such as plywood, concrete slabs or wherever heat is desired. No waiting required after installation so you can begin laying the flooring immediately.